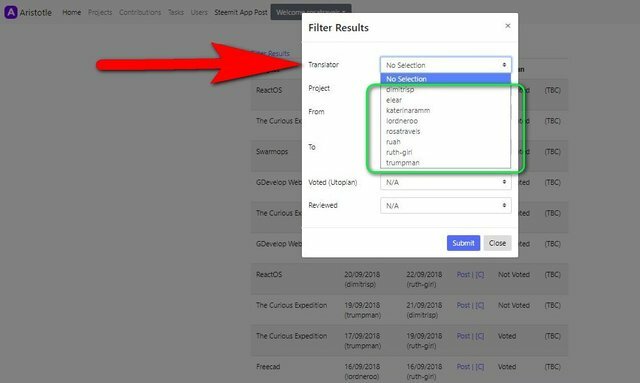 I can see that our translators are working hard for Utopian-DaVinci platforms and in turn adding much value to the Steemit Platform. This is my write-up for the 4th week of October. In the following report, you will see that I place special emphasis on the kind of activities that are happening in the 17 Language Groups because only in this way are we able to monitor activities that are happening in each language group. My analysis will not go into the individual contributors because at present we have 101 translators and I do not have a good chart analysis to show this kind of statistics yet. 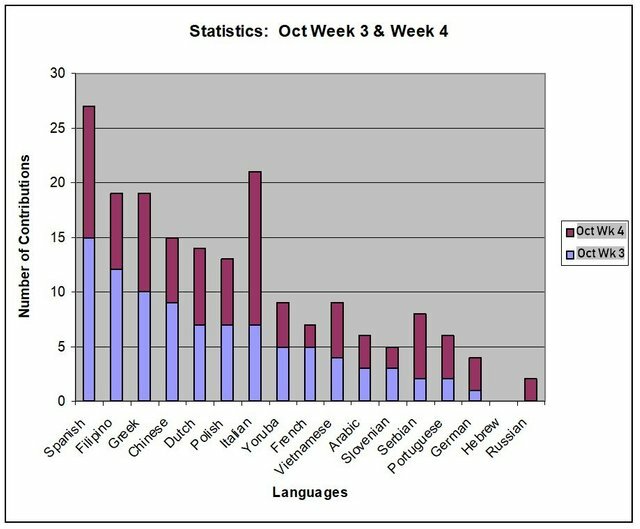 The following chart shows the distribution of the contributions in the different language teams for 2 weeks in October. I only started counting the number of post contributions for these Weekly reports in the last 2 weeks. So there are only 2 weeks of comparisons. Hebrew language group has not started yet as they are still organizing the work in the team. 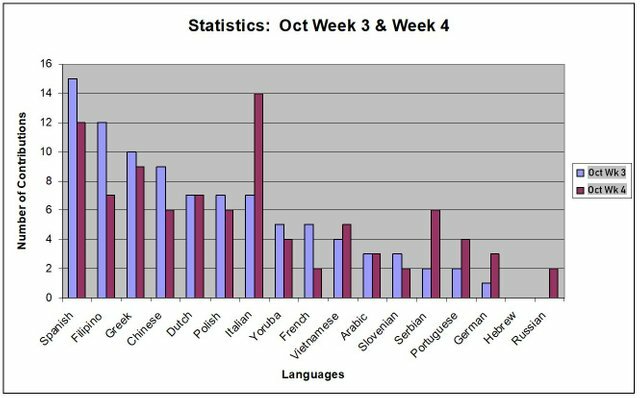 By looking at these statistic bar graphs, it will help us monitor the activities that are happening in the different language groups. I just started gathering the statistics in the last 2 weeks of October for these weekly reports. From the graph, apparently for posts reaching higher than a score of 70 did not get an upvote this week. But some other translation posts with a score lower than 70 got upvoted. I am not sure what the reasons are behind this and we still need to investigate into this matter. 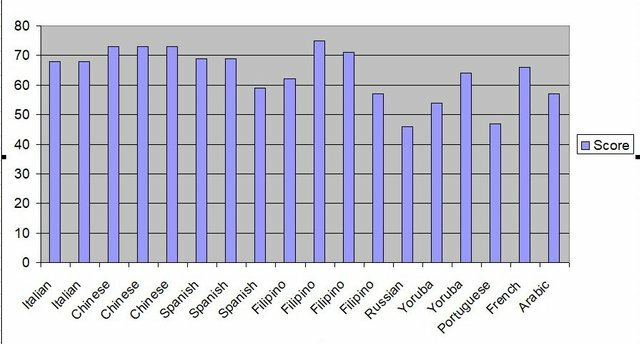 If we combine this graph to the earlier table (#1) where I listed out the number of contributions submitted this week, here is the analysis of language groups that did not get rewarded. The translator has done an excellent job with full accuracy. As noted by the Spanish moderator, the writing style is correct and most appropriate for the Spanish language. The translator has also put in a detail effort to write out an overview of the translation process and what he had learned, especially in explaining the Module System and Code Refactoring. We appreciate the personal touch he put into writing the submission post. The Drop down menu lists all the translators. Right now, you only see the Greek team and some of us who are trying out the demo. 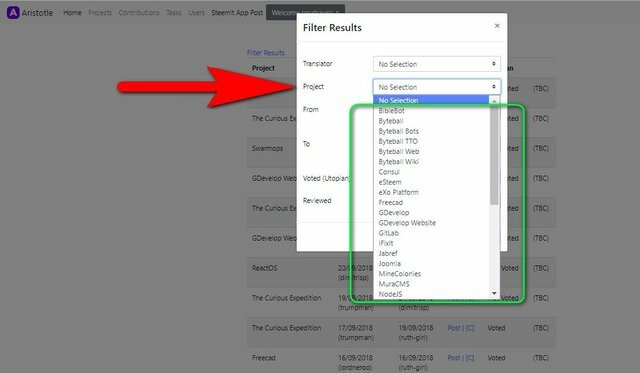 The Drop down menu lists all the projects ready for translation. The recruiting is now done continuously by the DaVinci Team. We wish to continue to consolidate our present language teams. If you would like to be a translator, please send in your application to #job-application room in the DaVinci Discord Channel. This week, we have one new translator added to the Russian Team. Let's welcome @bell1982 to the Russian Team. I've started interviewing our moderators so that the community can get to know them better. Fantastic, this report is well detailed and illustrated with those excellent charts, that shows all the activities on the Translations category. Keep up the great work. By the way, I found this, Translators' Activitites Moderators' Activitities.....fix it. Please note that while the CM haven't changed the footer, I am not scoring #iamutopian posts based on the questionnaire. They have their own metric, and that will be the case until we go live with the new guidelines and new questionnaire, which will be comprehensive enough to reflect these types of posts. There is a lot of information contained in this summary. I would suggest to talk to @amosbastian and see if some of the contributions that you have in the "not voted" section were supposed to be voted or they still may be voted later. I like the efforts of the Greek team, resp. the Greek LMs in particular. 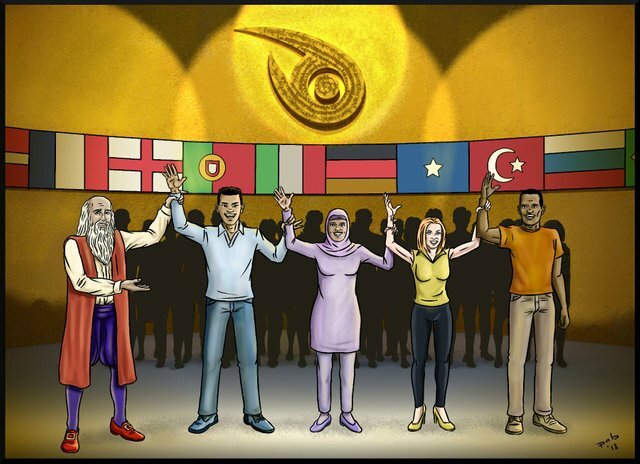 The work on a new app is good and if there is a chance that it could be extended to other language groups, it looks like it is going to be a huge help for all members. Thanks @espoem. I am on mobile right now so in case the meeting is on, the 18 posts that got unvoted were all 'expired' meaning that it is more than 7 days already and can't be upvoted. Actually out of the 93 posts, only about half got voted. There is still another 20+ still pending waiting to be voted. Yes, the Greek app is going to open to all translators. Right now, only the Gk team people are trying it out first as it is still developing. Thank you again.